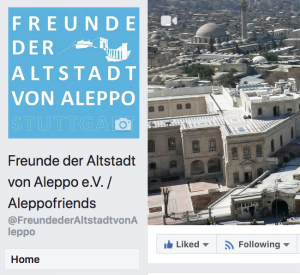 Aleppofriends on Social Media – Freunde der Altstadt von Aleppo e.V. Our association is now on Facebook. There, we will be able to share the current discourse on Aleppo with the help of news, and initiatives by us and others. We are looking forward to a constructive discourse with members and everybody who is interested in Aleppo’s heritage and society.